I am co-organizing the 2019 Association for Women in Mathematics Research Symposium to be held at Rice University, April 6-87, 2019. This research is partially supported by the National Science Foundation (DMS-1613279). Any opinions, findings, and conclusions or recommendations expressed in this material are those of the author, and do not necessarily reflect the views of the National Science Foundation. Low-dimensional topology and geometry, group theory, non-commutative algebra. 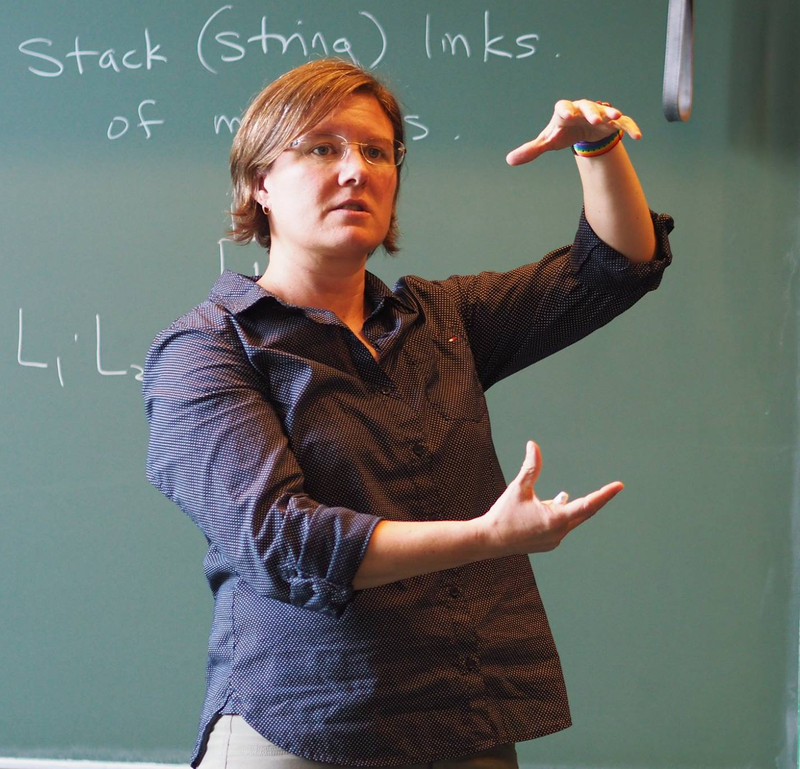 AIM workshop on "Distinguishing smooth concordance classes of topologically slice knots and links," June 3–7, 2019. 2019 AWM Research Symposium, Rice University, April 6-7, 2019. AWM Research Symposium 2015, University of Maryland, College Park, April 11-12, 2015. Special Session on Low-Dimensional Topology at the AWM Research Symposium, University of Maryland, College Park, April 11-12, 2015. AMS Special Session on Knot Theory at the Joint Math Meetings, San Antonio, TX, January 12–13, 2015. "Hempelfest" 3-Manifolds: Heegaard Splittings, the Curve Complex, and Hyperbolic geometry, Rice University, April 19-21, 2013. AMS Special Session on Knot Theory at the Joint Math Meetings, Boston, MA, January 4-7, 2012. Special Session on Low Dimensional Topology and Geometry at the AMS Fall Southeastern Section Meeting, Winston-Salem, NC, September 24-25, 2011. AMS Special Session on Knot Theory at the Joint Math Meetings, New Orleans, LA, January 8-9, 2011. Special Session on Low Dimensional Topology at the AMS Fall Eastern Section Meeting, Middletown, CT, October 11-12, 2008. A non discrete metric on the group of topologically slice knots; Conference on Topology in Dimensions 3, 3.5, and 4 (in honor of Abby Thompson, Marty Scharleman, and Rob Kirby), UC Berkeley, June 2018. Fractal nature of the space of knotted curves; Colloquium, Monash University, Melbourne, Australia, March 2018. The geometry of knot concordance spaces; Topology Seminar, UC Berkeley, September 2014. 4-dimensional equivalence relations on knots; Invited Address at the AMS Southeastern Sectional Meeting in Winston-Salem, NC, September 2011. Knots and link concordance; Connections for Women: Homology Theories of Knots and Links at MSRI, January 2010. Torsion in the knot concordance group; Cascade Topology Seminar, University of Oregon, October 2009. Torsion in the knot concordance group; 2009 Georgia International Topology Conference, May 2009. A survey of knot theory and its combinatorial invariants; CombinaTexas: Combinatorics in the South-central US conference, University of Houston, April 2009. Subgroups of the mapping class group and higher-order signature cocycles; Colloquium, University of Indiana, Bloomington, March 2009. Subgroups of the mapping class group and higher-order signature cocycles; Texas Geometry and Topology Conference, University of Houston, February 2009. Filtrations of the Knot Concordance Group; Colloquium at University of Riverside, December 2008. Classical Knot Concordance and Blanchfield Duality; "Geometric Topology Conference," Beijing 2007. New Phenomena in Knots and Links; "4-Dimensional Manifolds," Oberwolfach 2006. Group theoretic invariants of links and 3-manifolds; "3-manifolds after Perelman," Edinburgh, Scotland, March 2006. Homology Equivalence of Groups and Spaces; "Knots and their manifold stories" held at BIRS in May 2004.